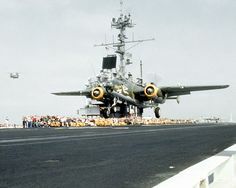 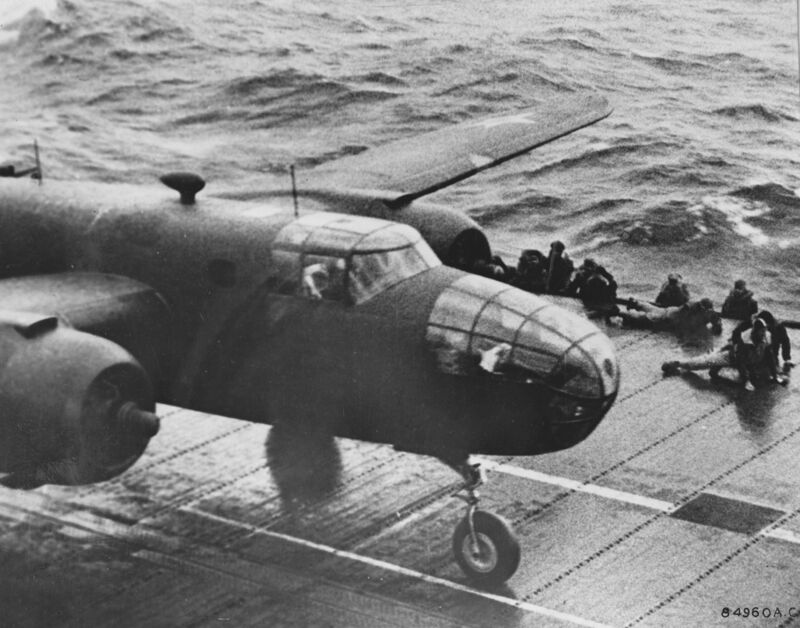 lex-for-lexington: B-25B Mitchell bomber piloted by James Doolittle taking off from USS Hornet CV-8, 18 April 1942. 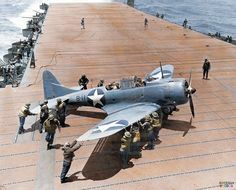 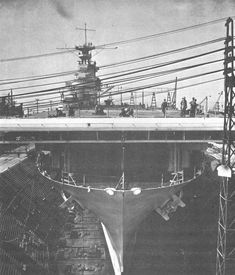 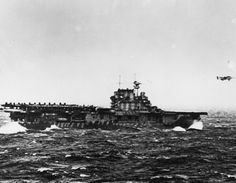 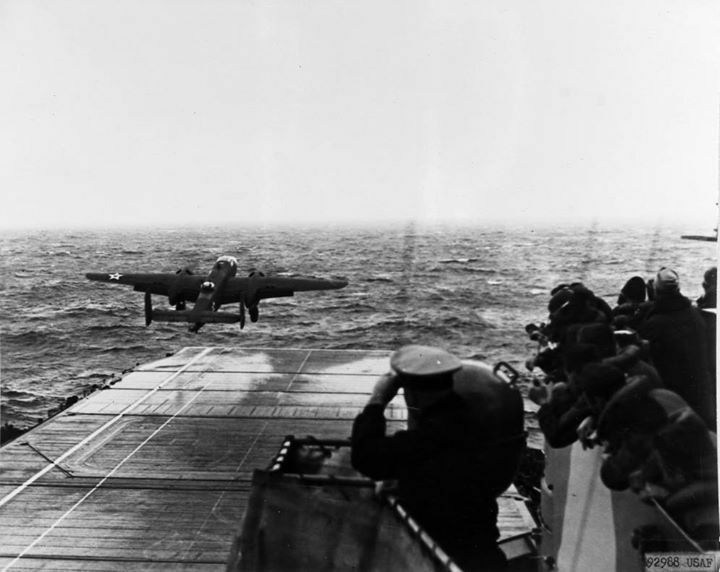 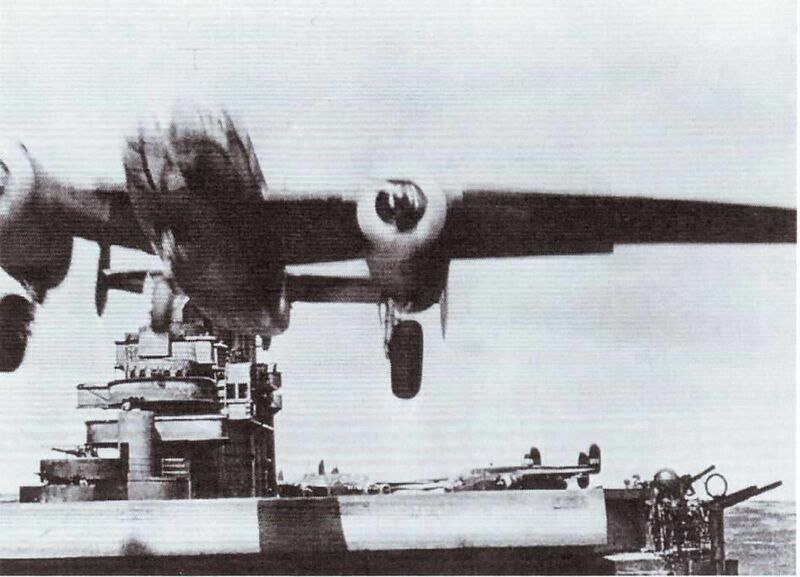 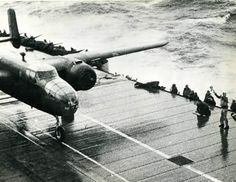 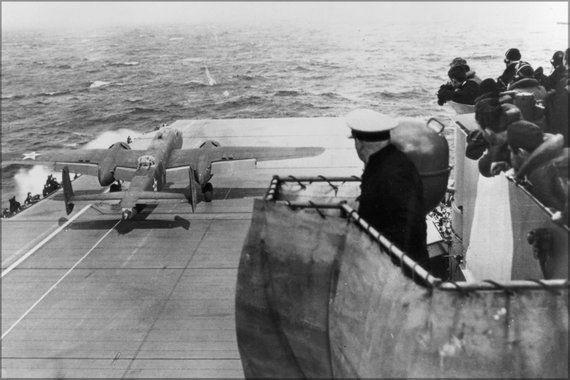 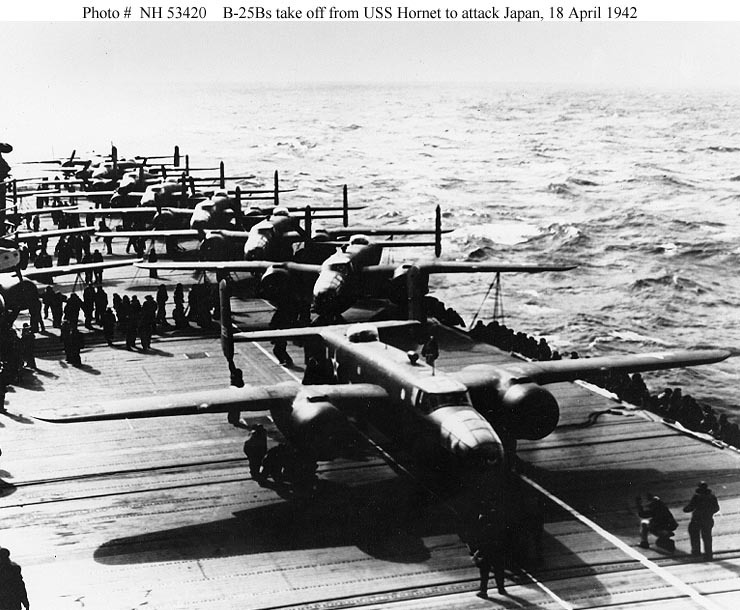 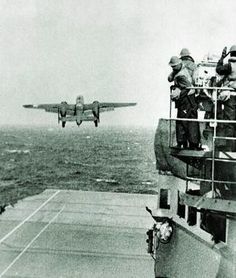 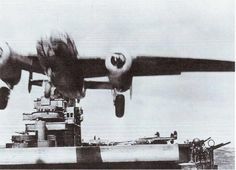 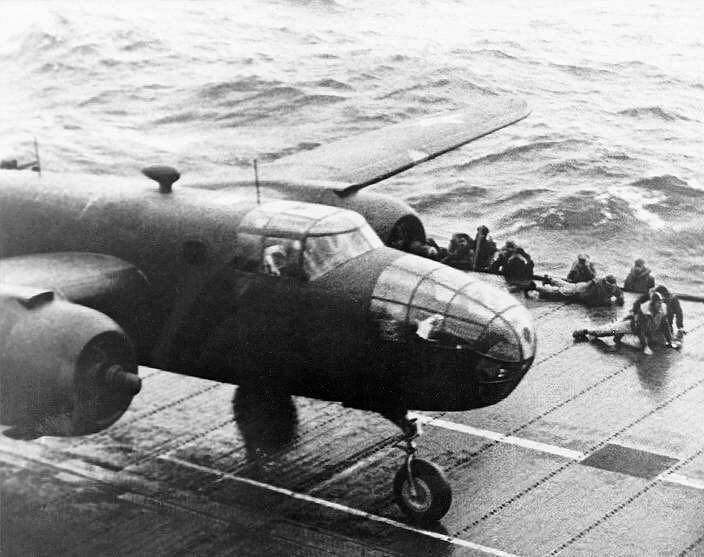 Hornet launching Doolittle raiders 18 April 1942. 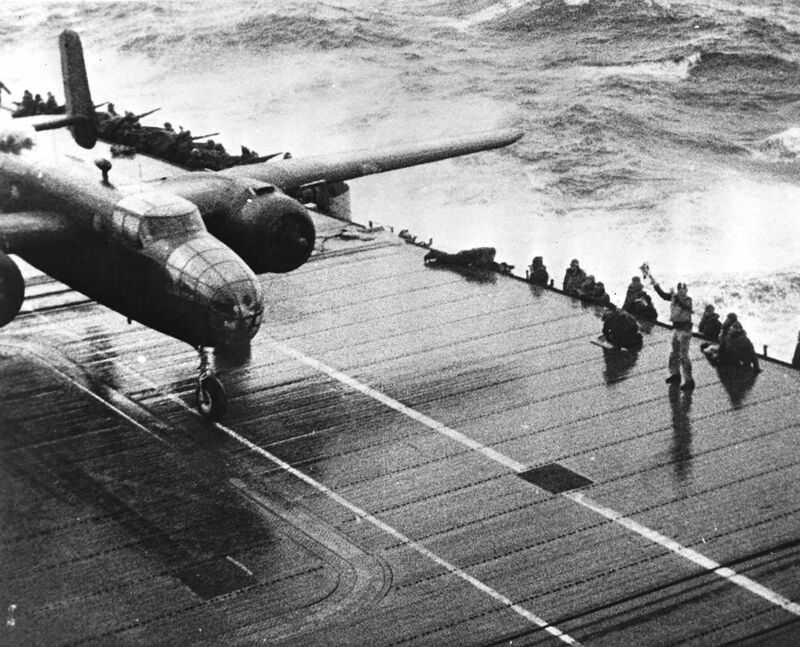 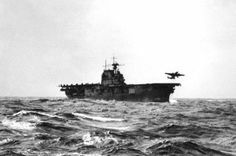 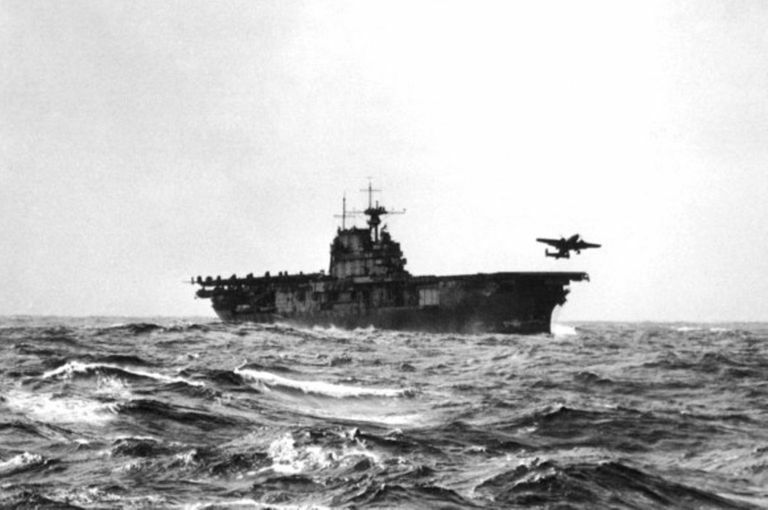 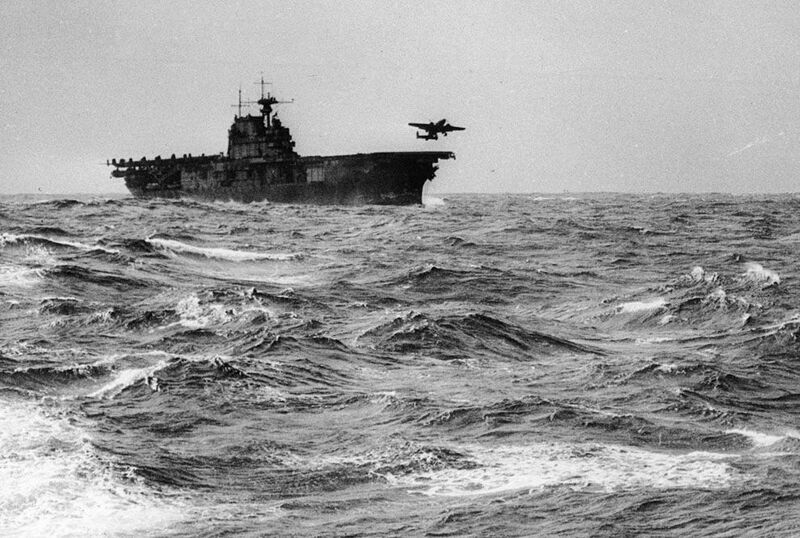 USS Hornet (CV-6) launching a B-25 Mitchell bomber during the start of the Doolittle Raid, April 18th, 1943. 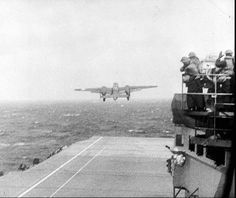 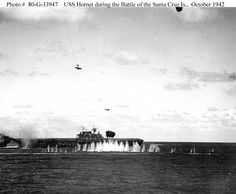 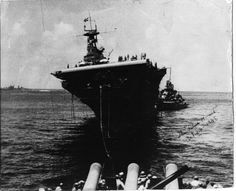 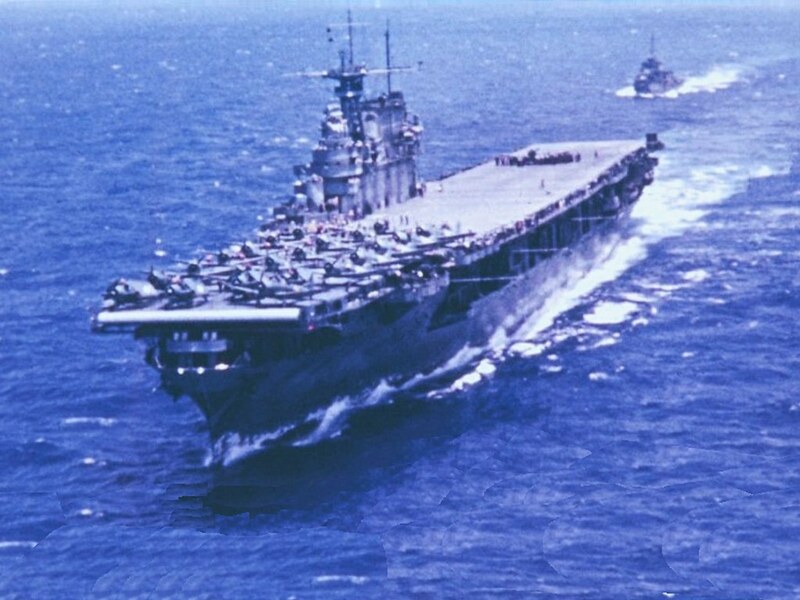 -View from the island of the U.S. Navy aircraft carrier USS Hornet (CV-8), while en route to the "Doolittle Raid" mission's launching point. 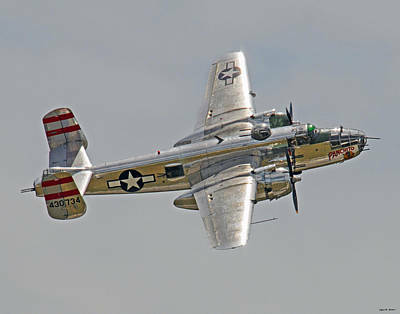 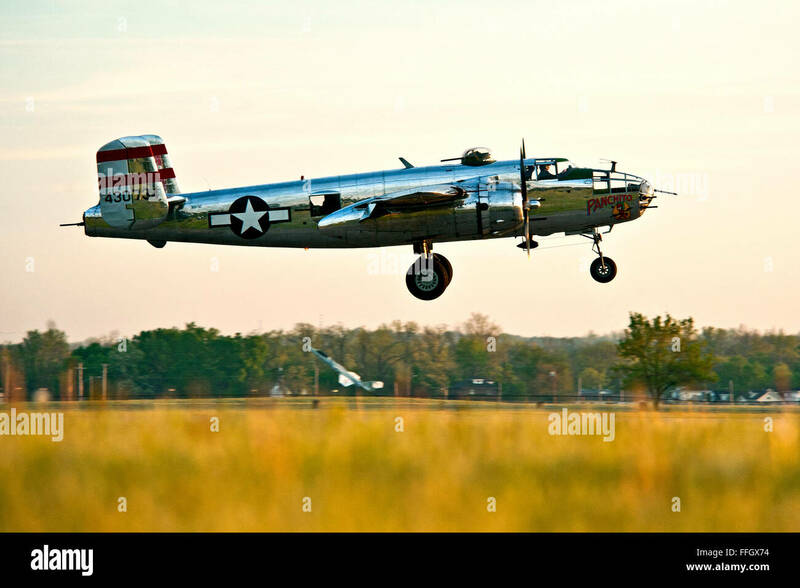 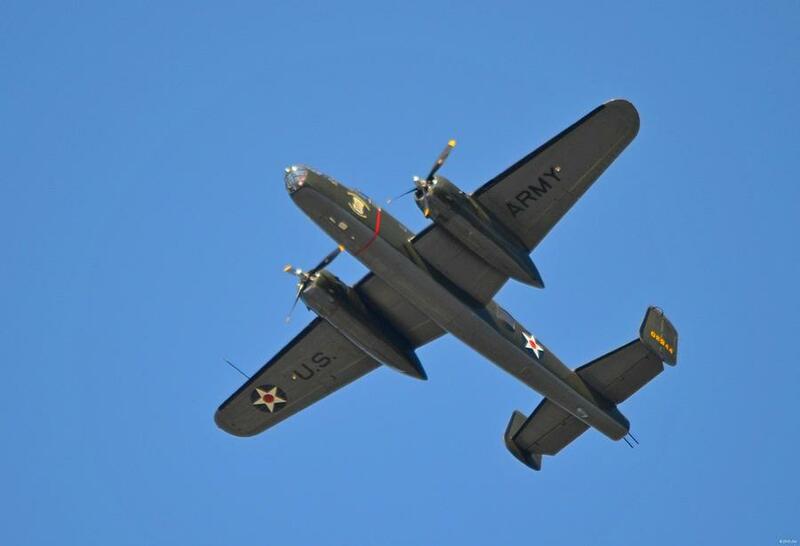 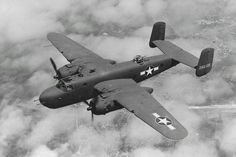 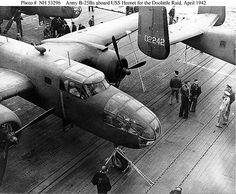 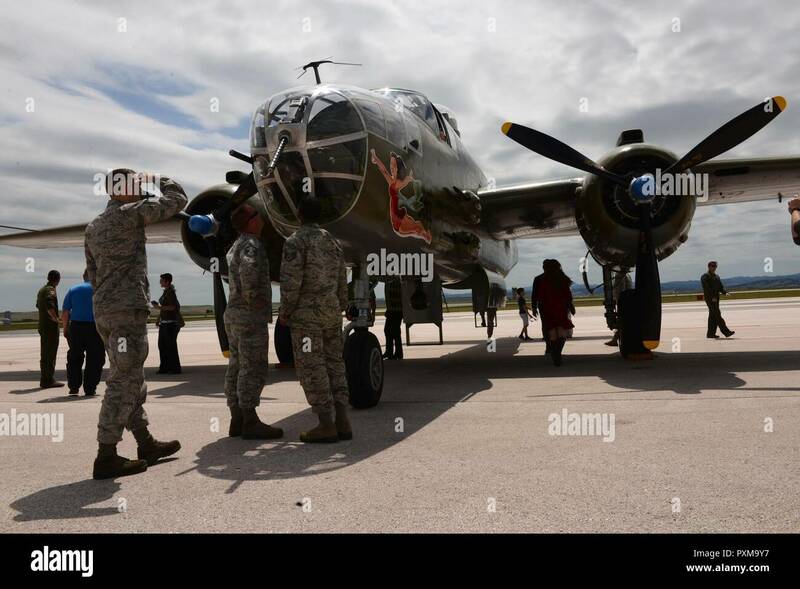 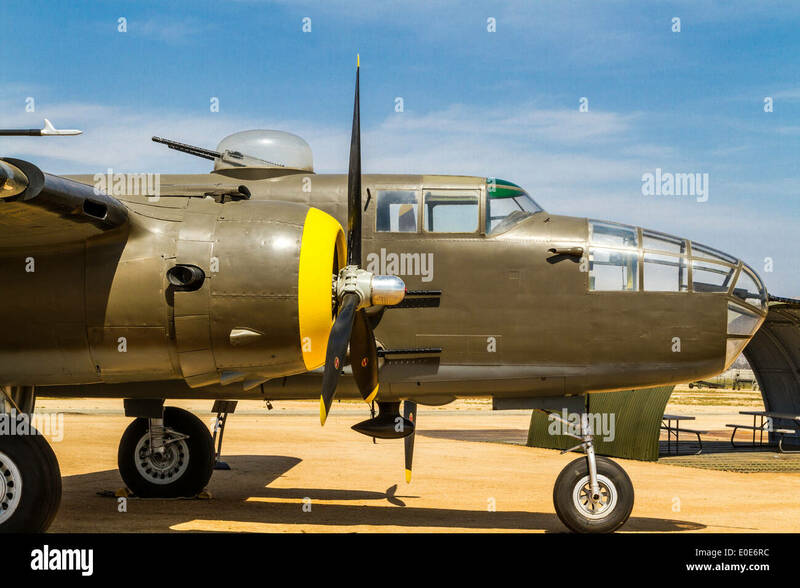 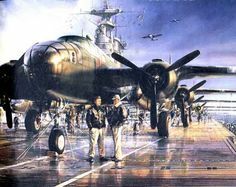 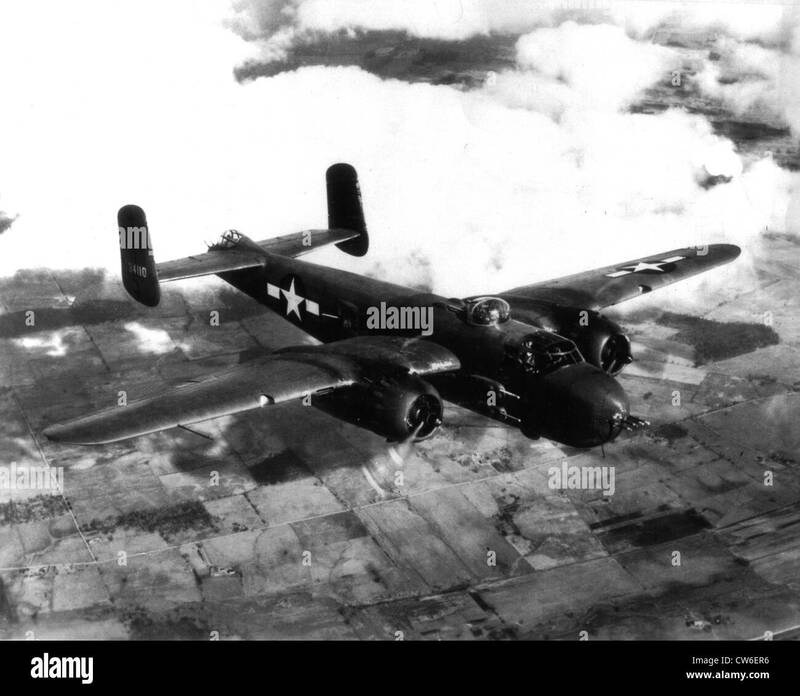 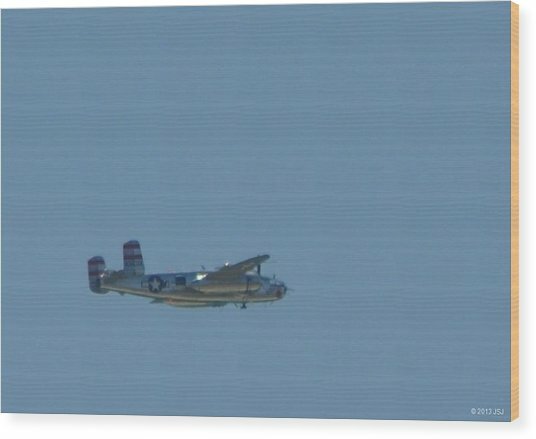 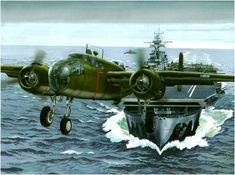 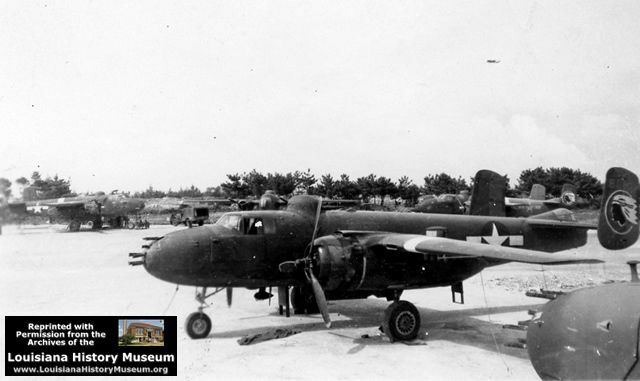 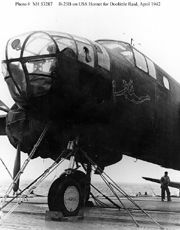 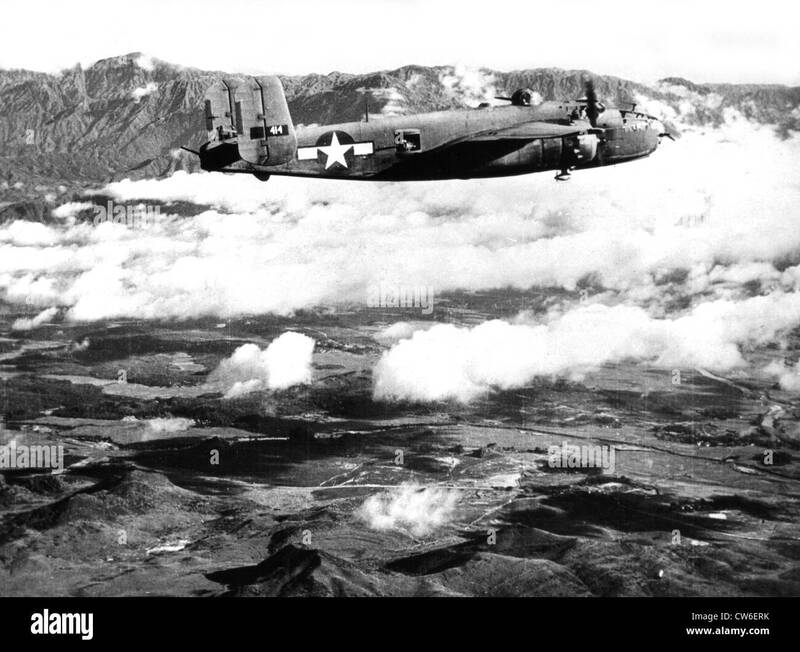 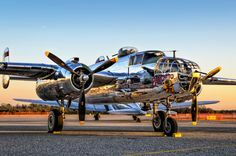 New listing 678) MILWAUKEE WI ~ GEN MITCHELL FIELD ~ AIRPORT ~ B-25 "BILLY MITCHELL BOMBER"
-NMUSAF Doolittle Raid exhibit. 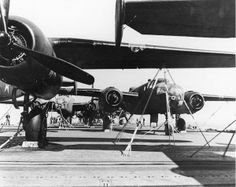 The engine shrouds cover the dissimilar engine exhausts of the 'D' model which varied from the 'B' models flown on the raid. 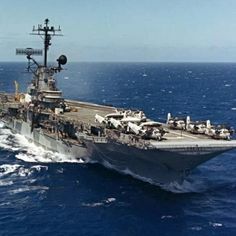 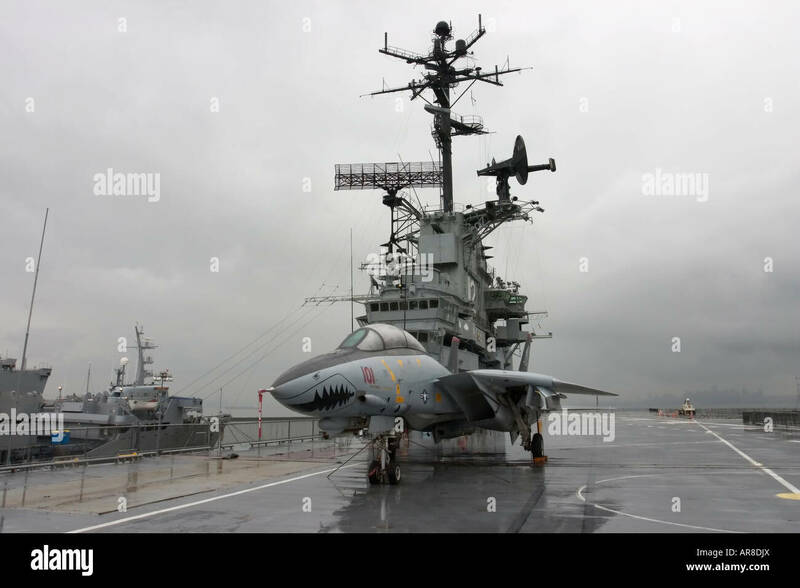 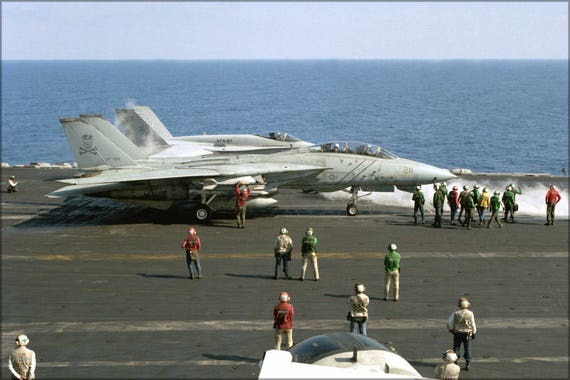 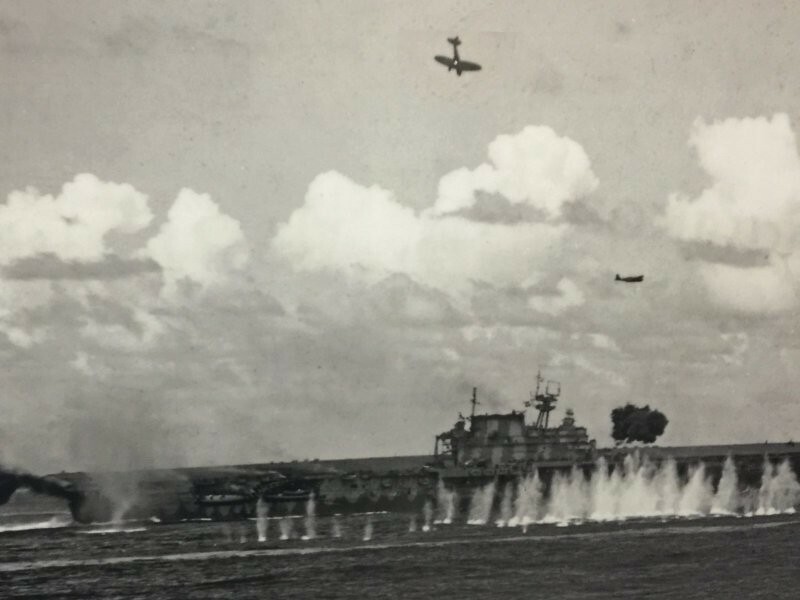 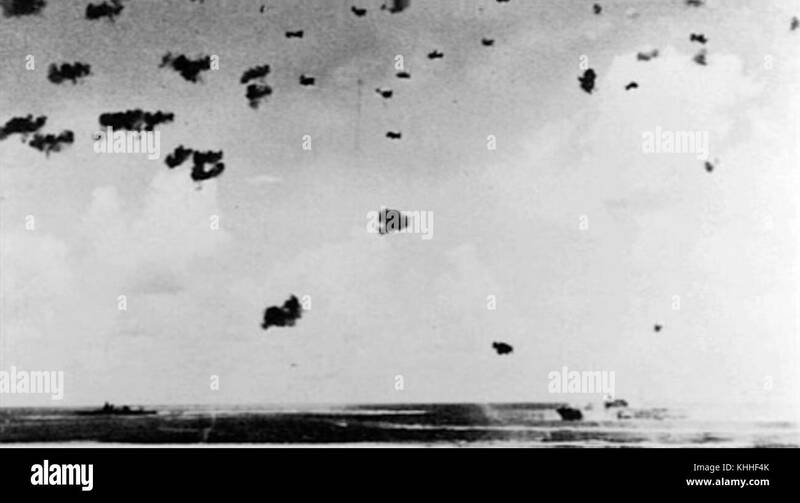 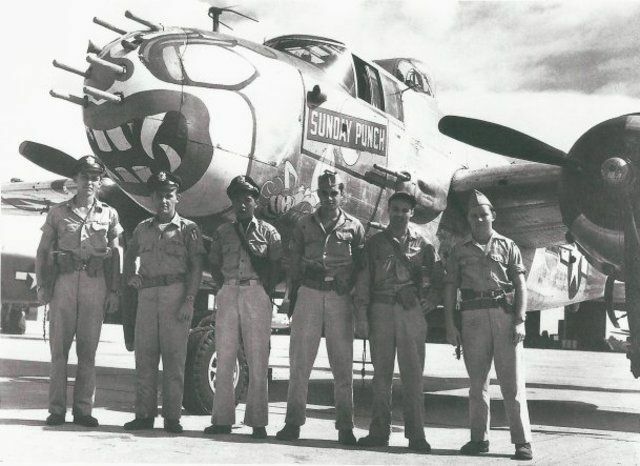 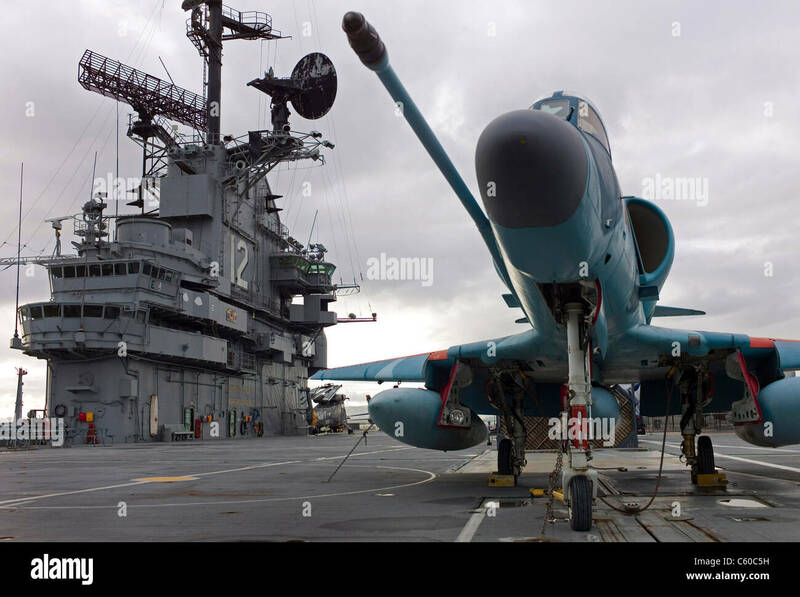 ... these crews received intensive training in simulated carrier deck takeoffs, low-level and night flying, low-altitude bombing and over-water navigation. 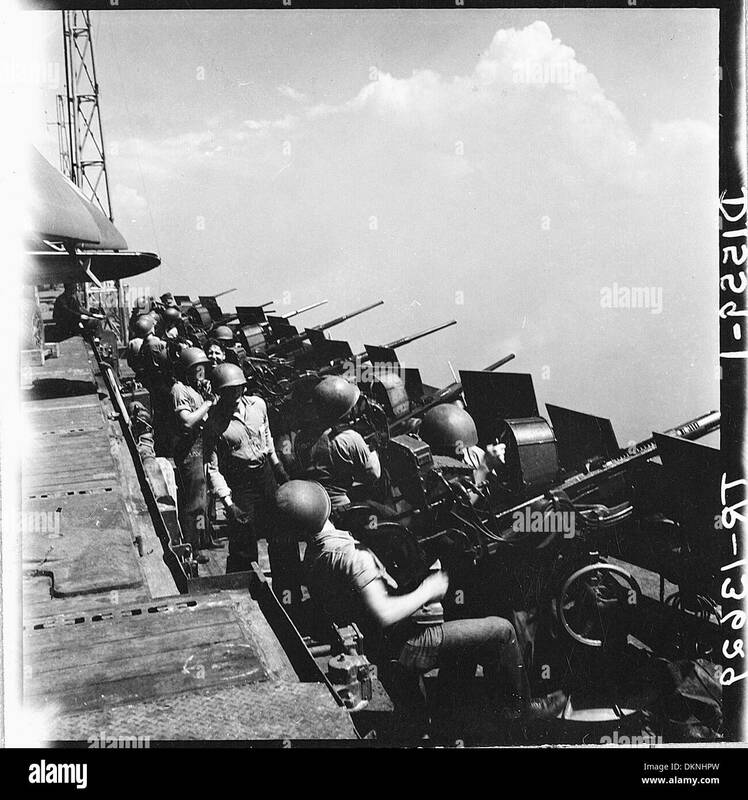 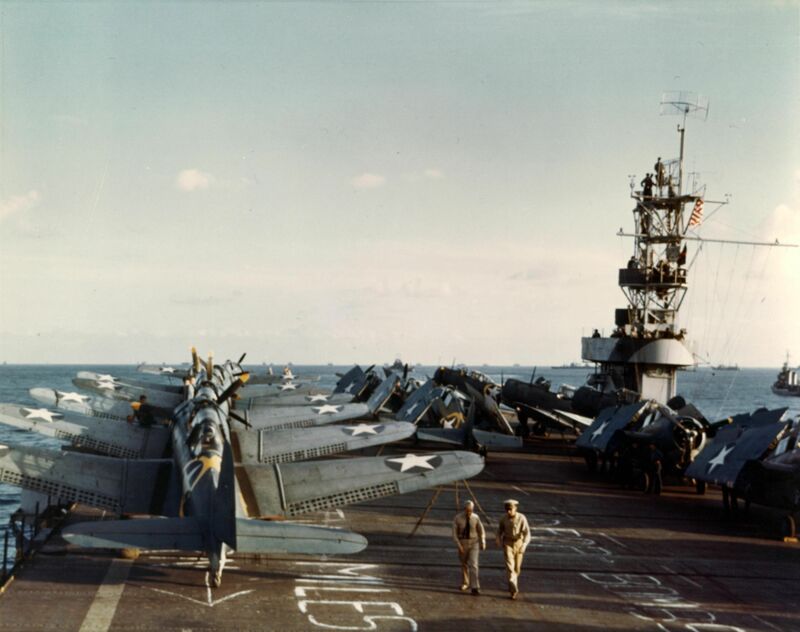 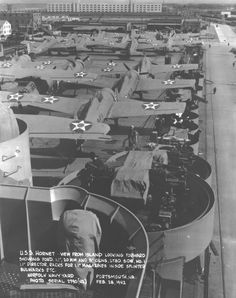 Flight deck of the USS Santee filled with SBD-3 Dauntless scout-bombers and F4F-4 Wildcat fighters bound for Operation Torch in North Africa, Nov 1942. 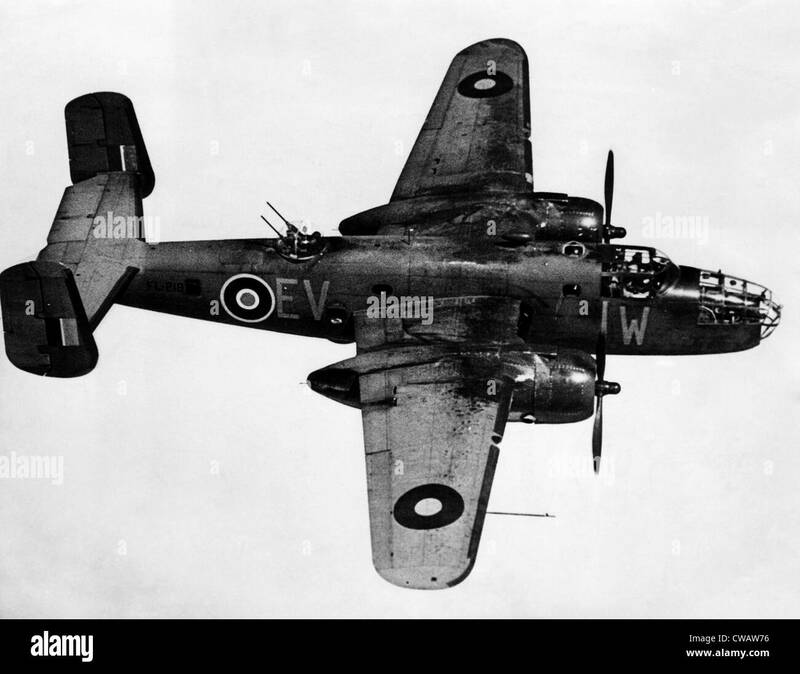 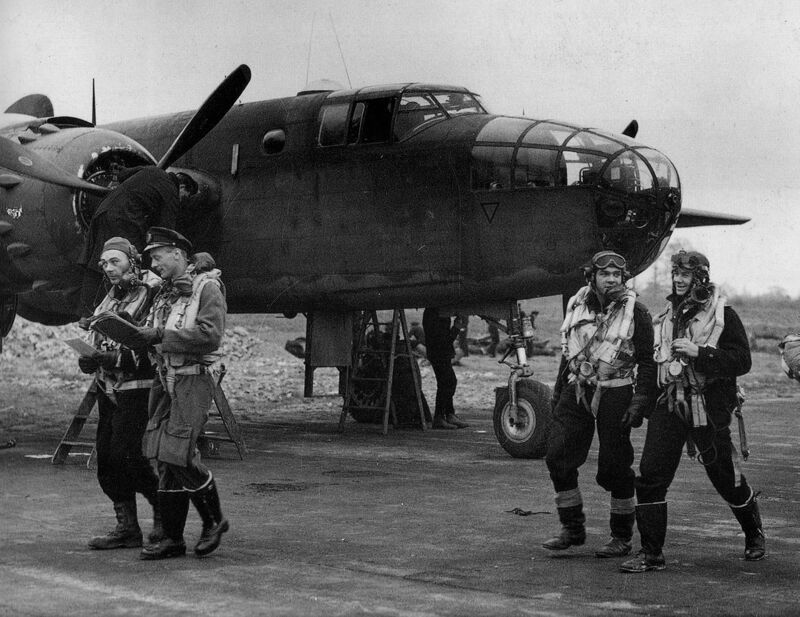 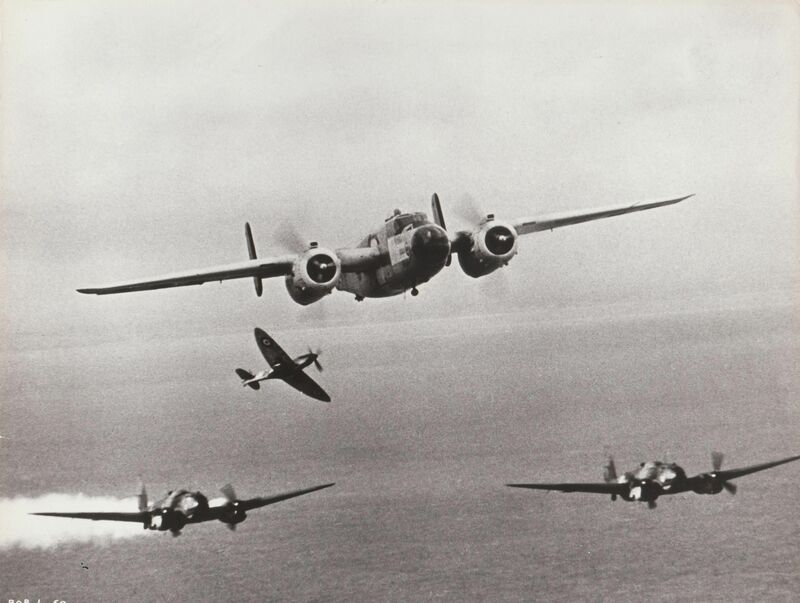 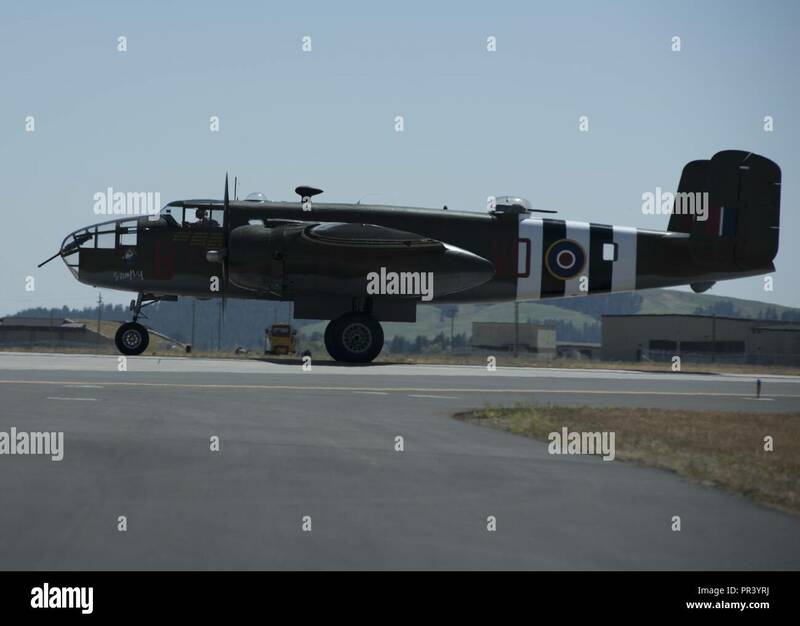 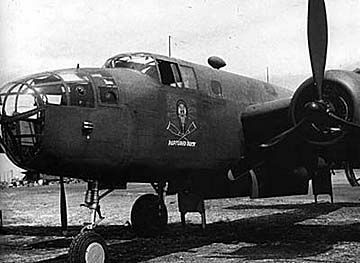 "The Battle of Britain" Film 1969 B25 Camera Ship "The Monster"
B-25 Mitchell pilots & crew. 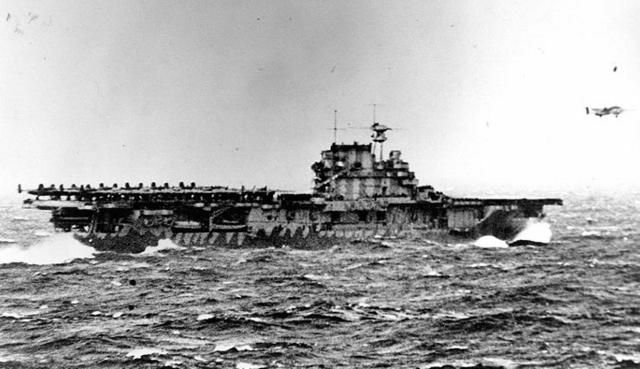 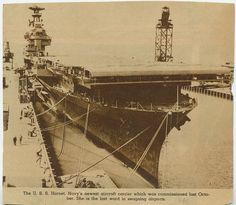 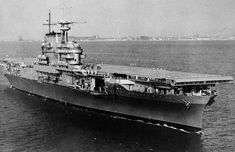 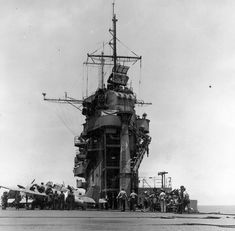 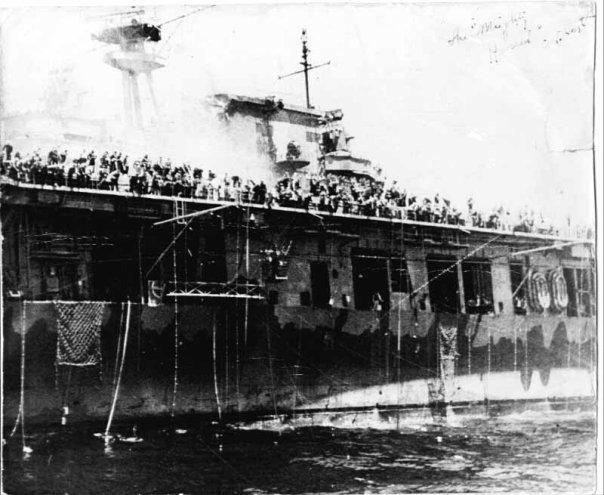 June 4, 1942: Crewmen on the USS Hornet CV-8 tend to the wounded following the incident. 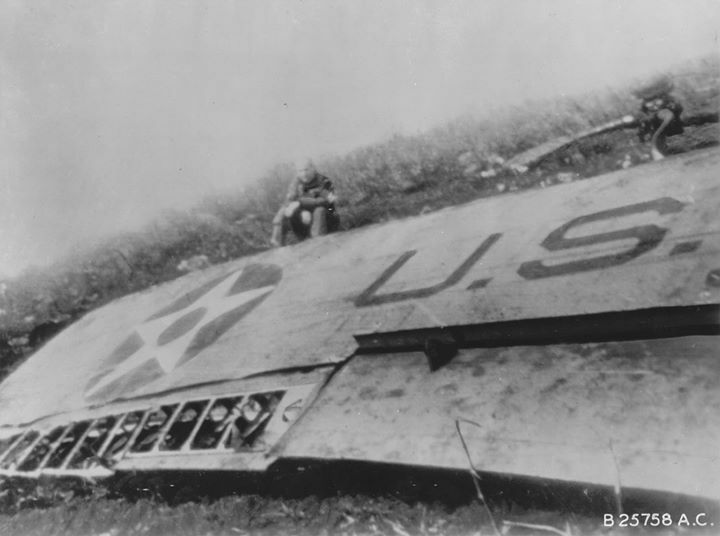 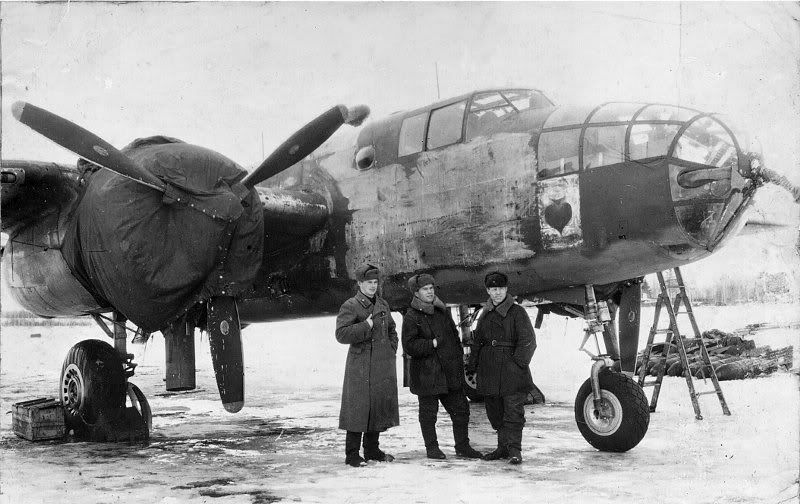 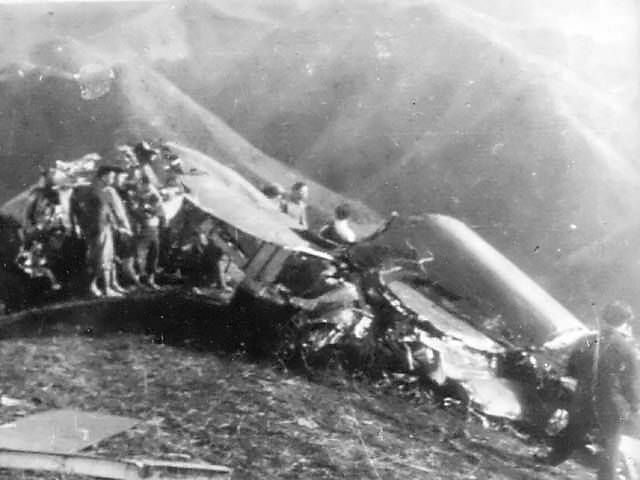 Wreckage of Major General James Doolittle's B-25 Mitchell bomber in China 18 April 1942. 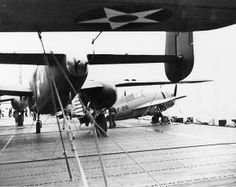 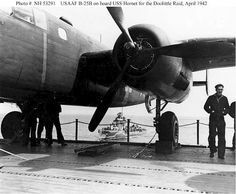 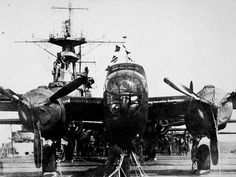 A Mitchell and an Wildcat aboard the USS Hornet as the carrier was steaming towards Tokyo to launch the legendary Doolittle Raid (April via U.
James Doolittle sitting by the wing of his wrecked B-25 Mitchell bomber China 18 April 1942. 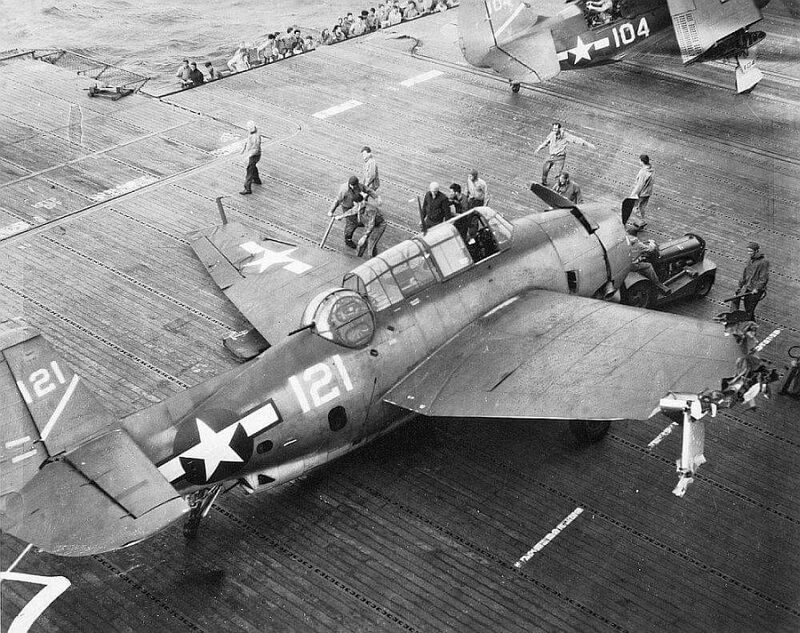 TBM Avenger of VT-5 after a deck crash on the USS Yorktown (CV-10). 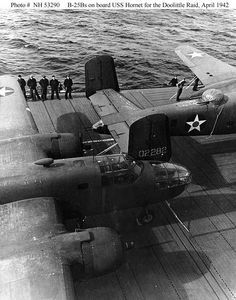 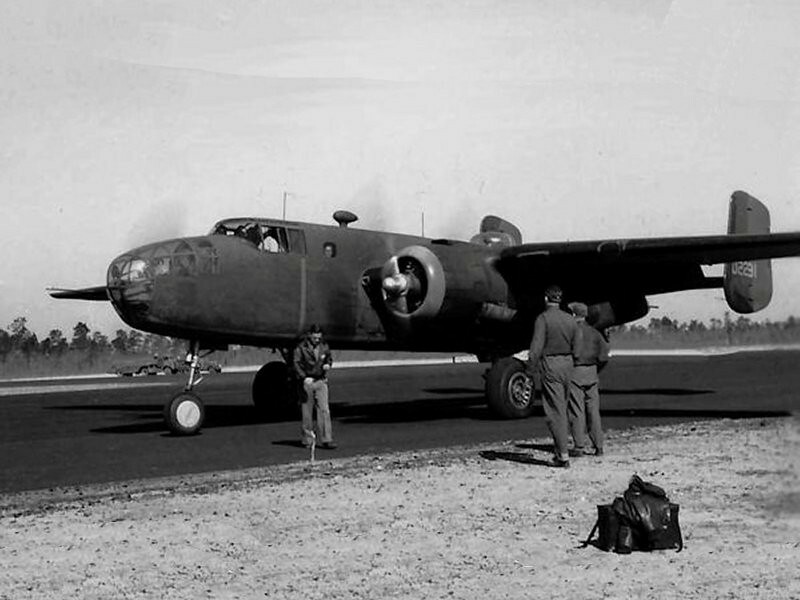 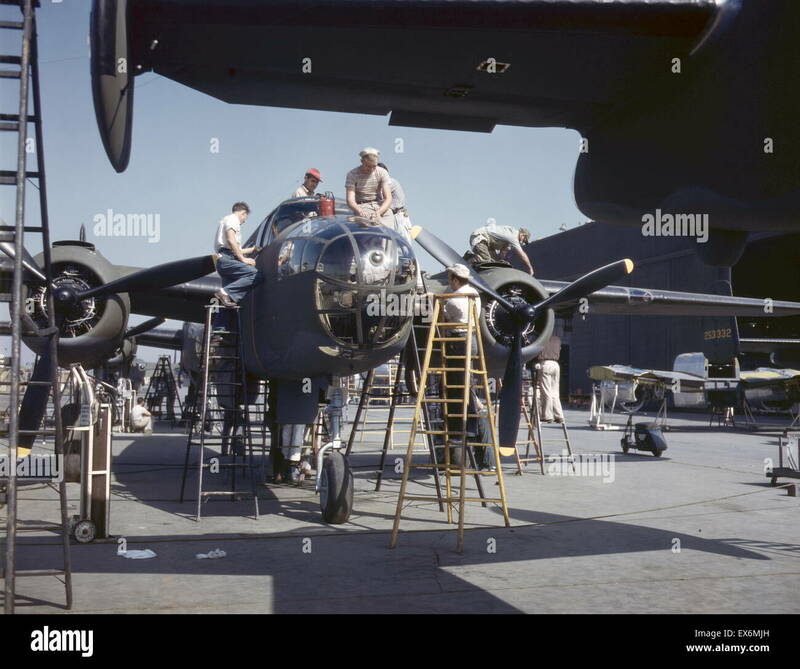 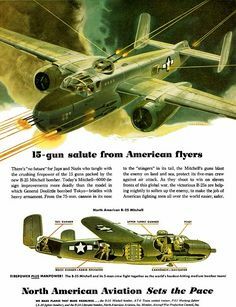 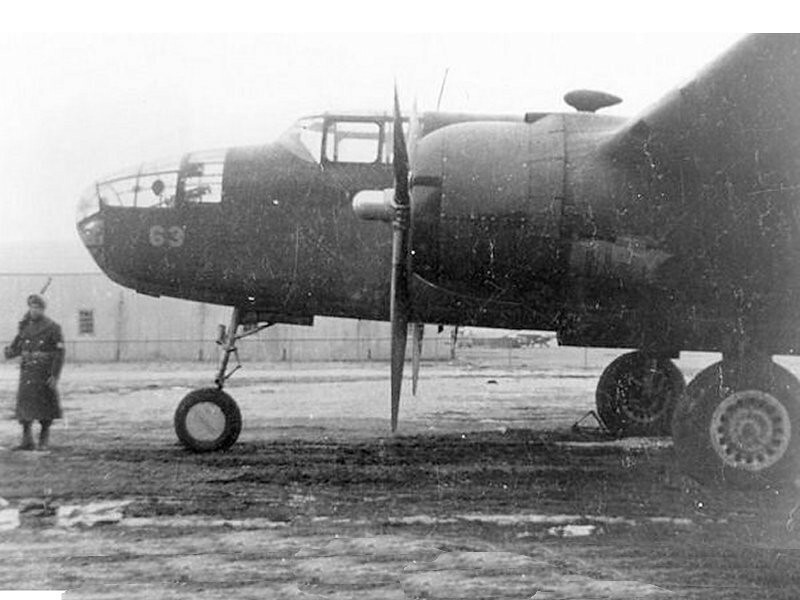 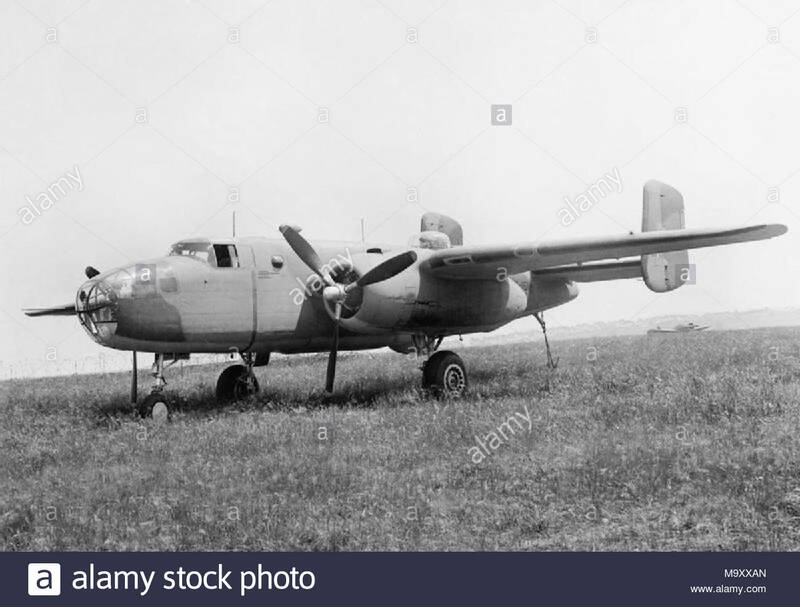 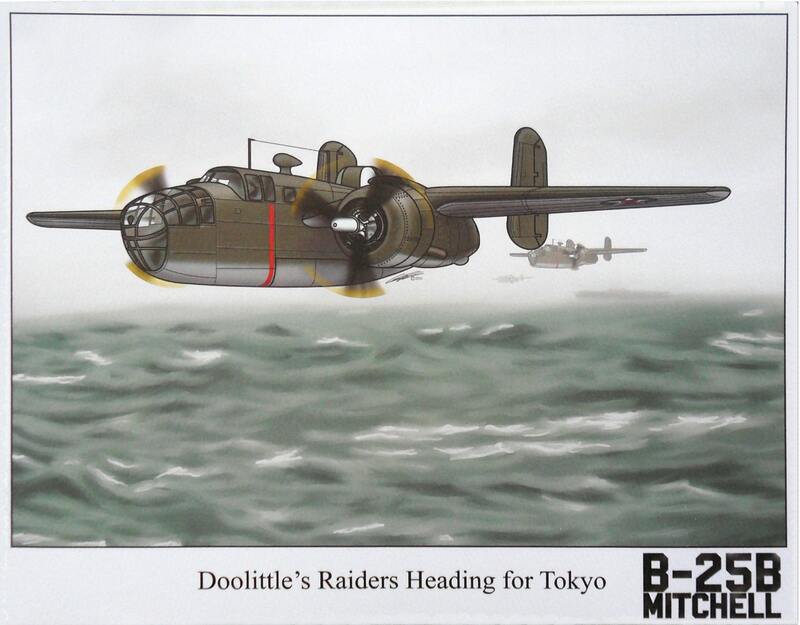 The Ruptured Duck: Flown by Lt, Ted W. Lawson (Doolittle Raid) 16 B-25's came from the 17 BG which was made up of the 34th, 37th, 95th, and 89th squadrons. 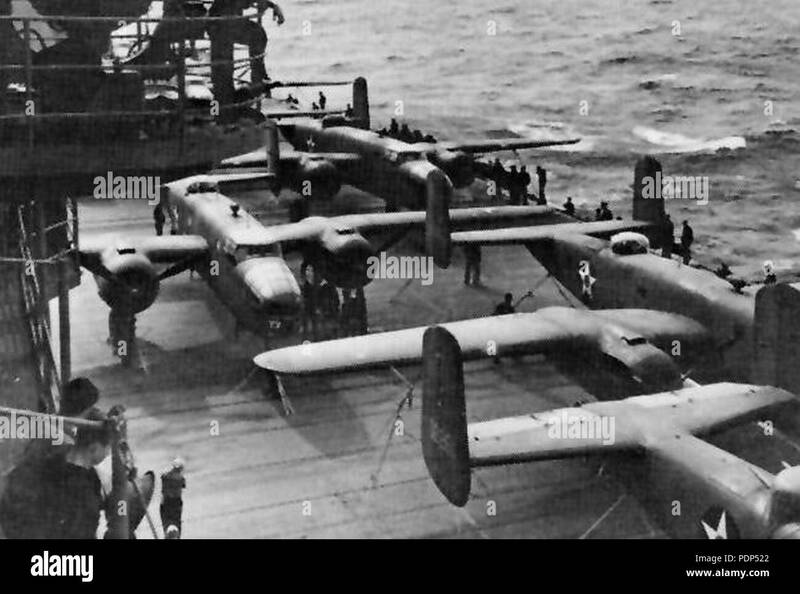 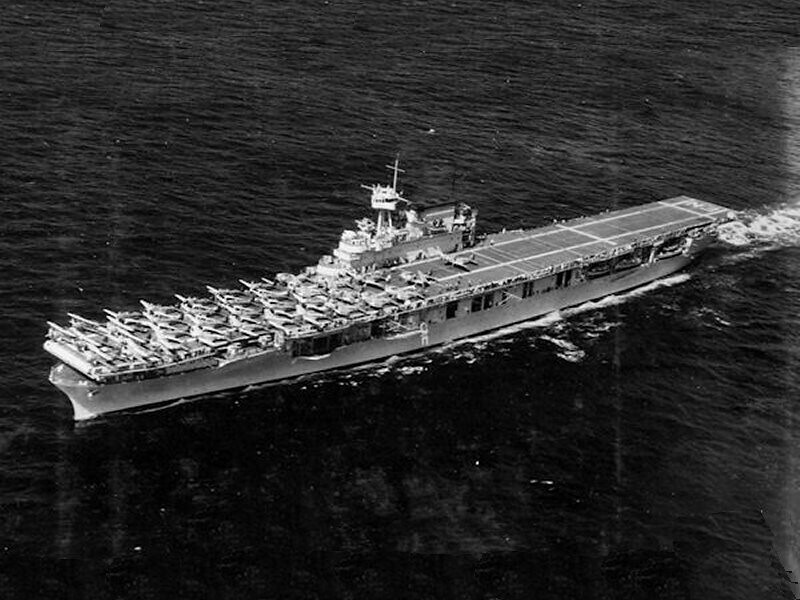 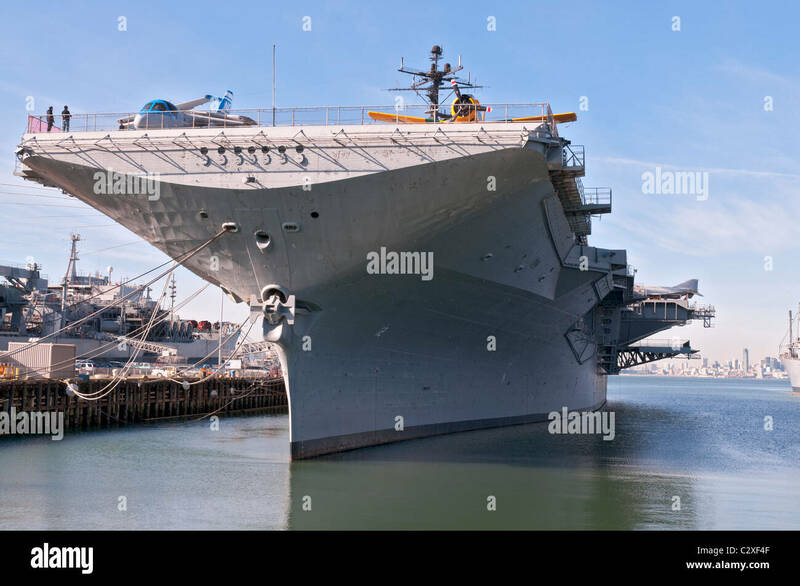 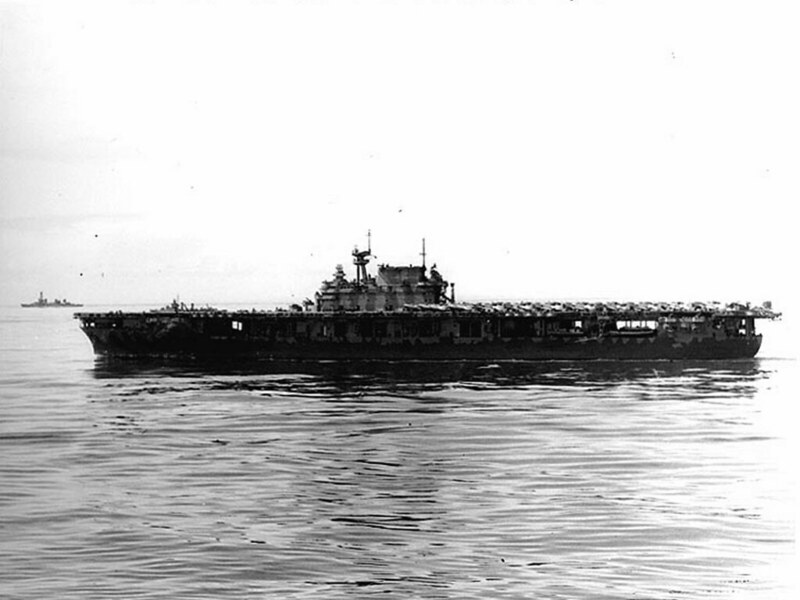 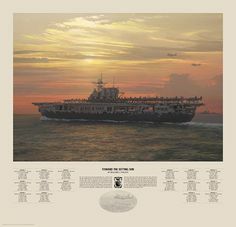 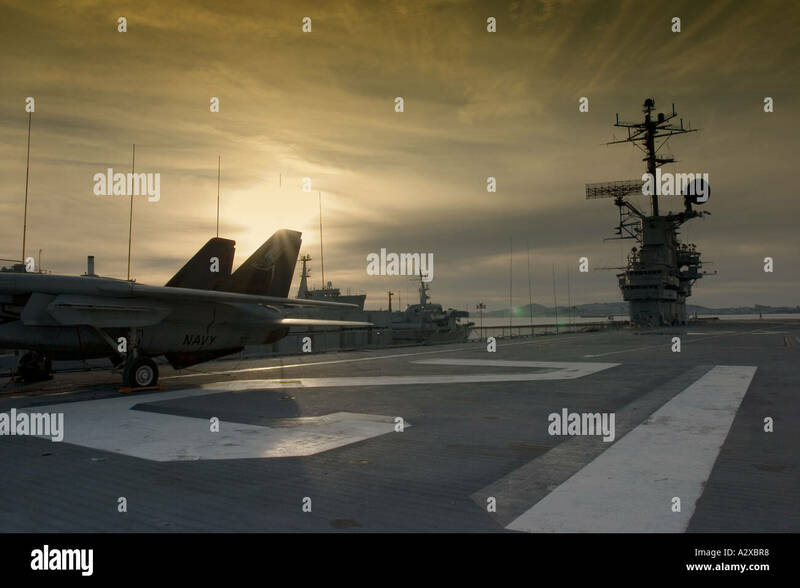 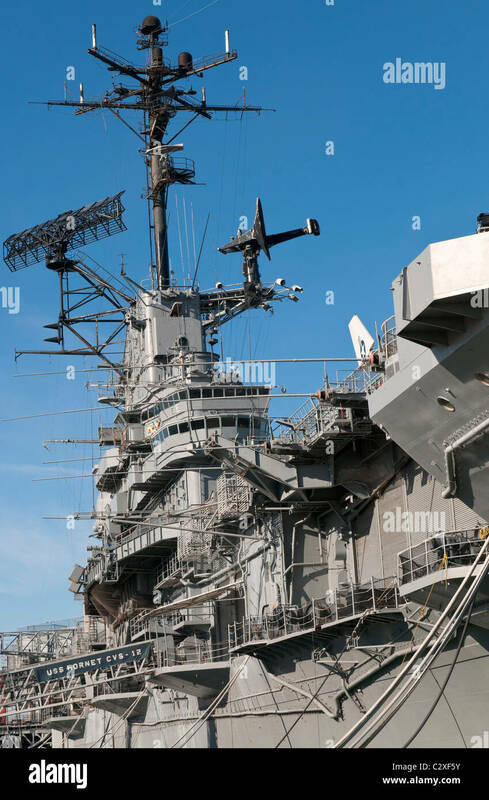 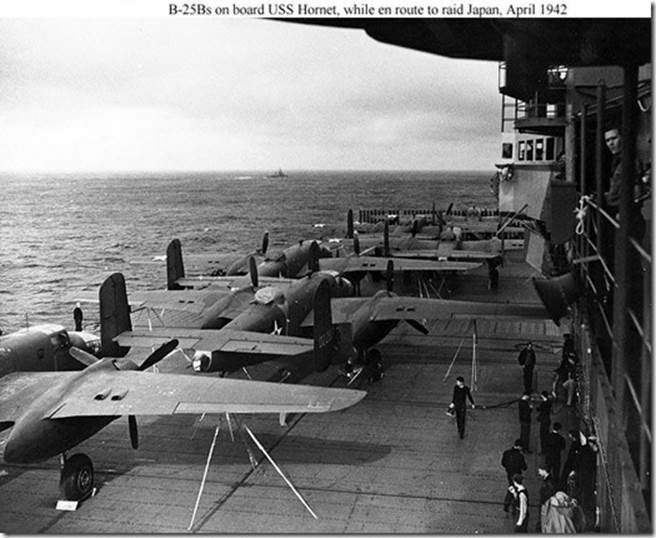 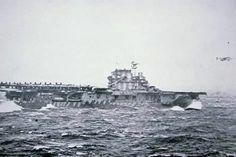 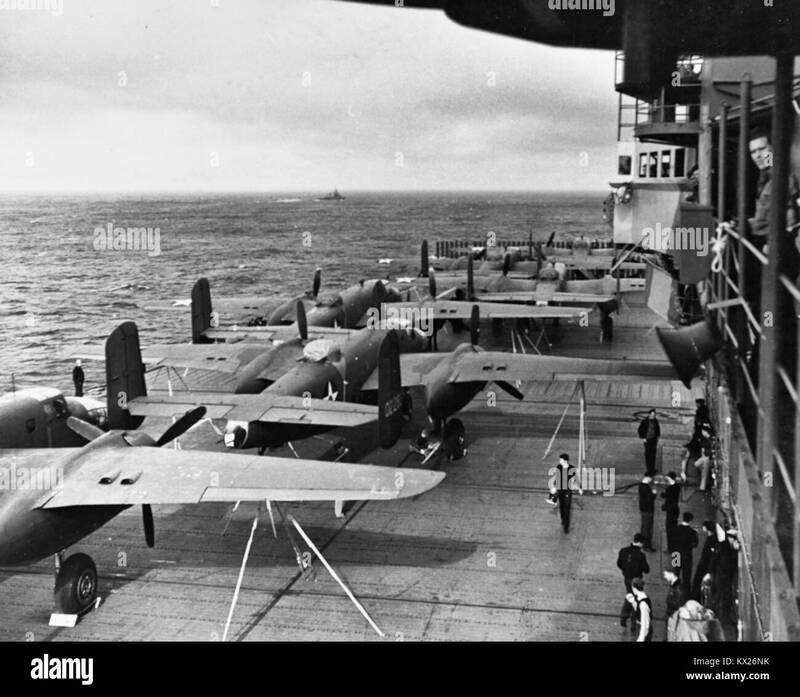 John D. Shaw Coronel James H. Doolittle, Captain Marc A. Mitscher USS Hornet, 18 Mitchells on Deck. 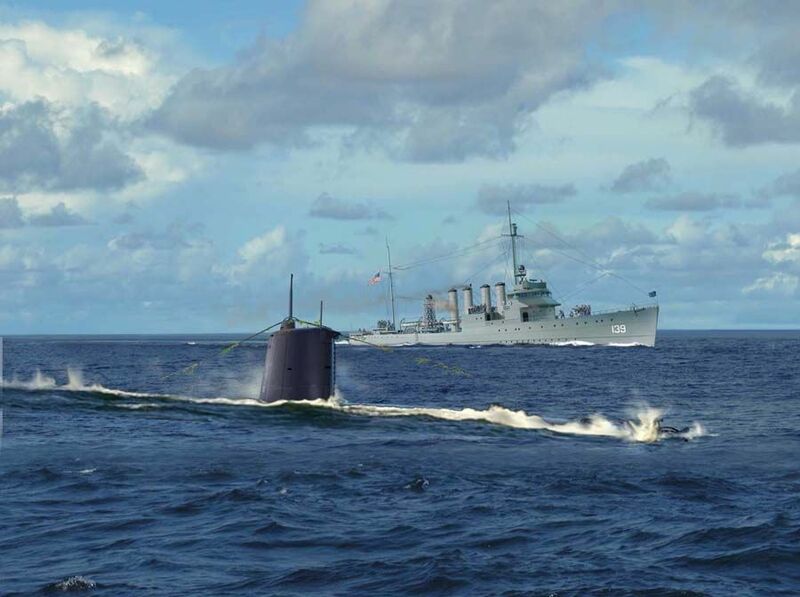 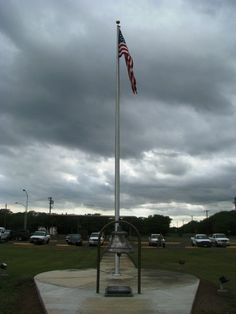 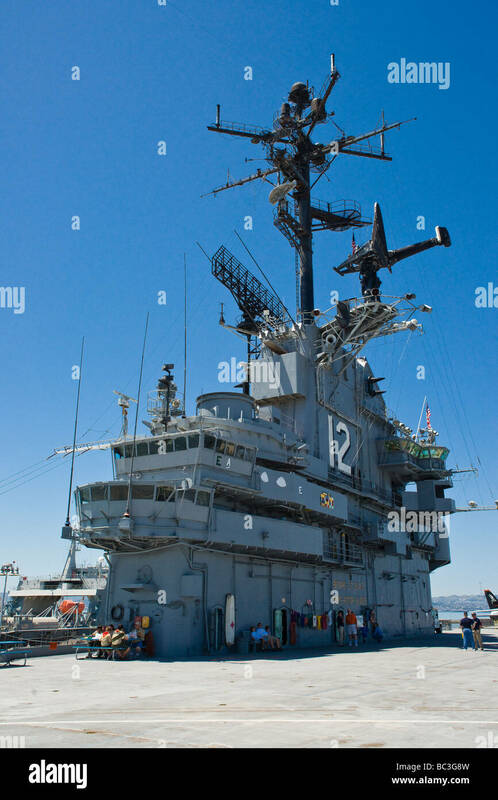 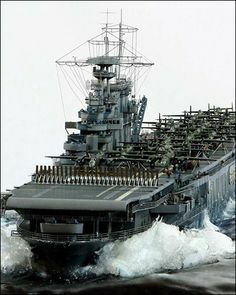 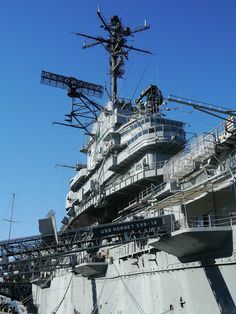 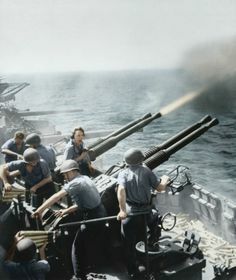 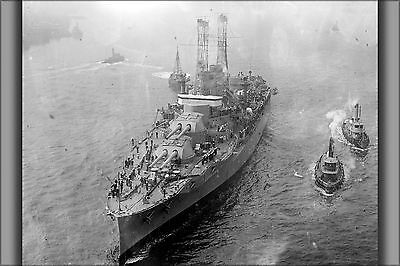 USS WARD , PEARL HARBOR !!! 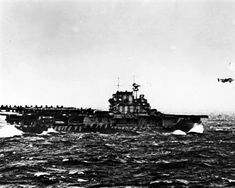 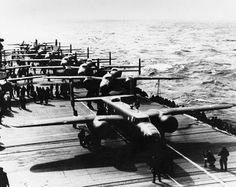 anniversary commemoration of the Doolittle Raid, wherein 16 flew off USS Hornet to bomb Japan in Here a restored takes off USS Ranger. 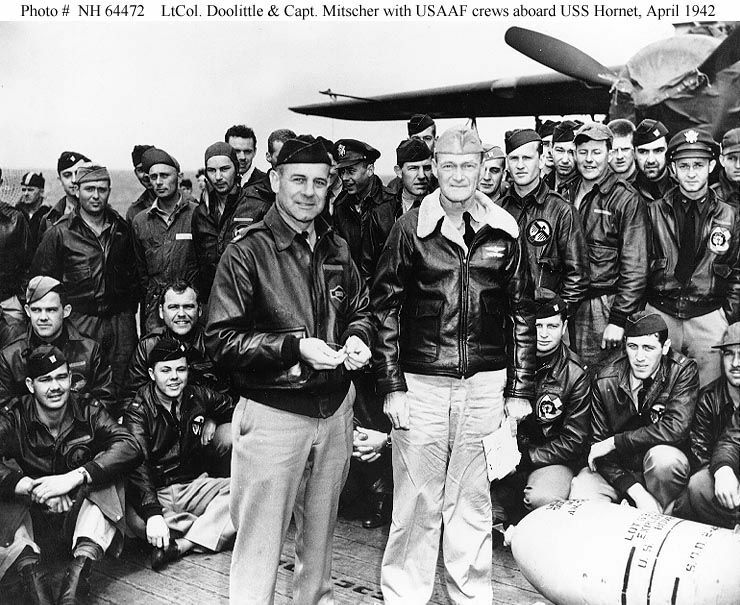 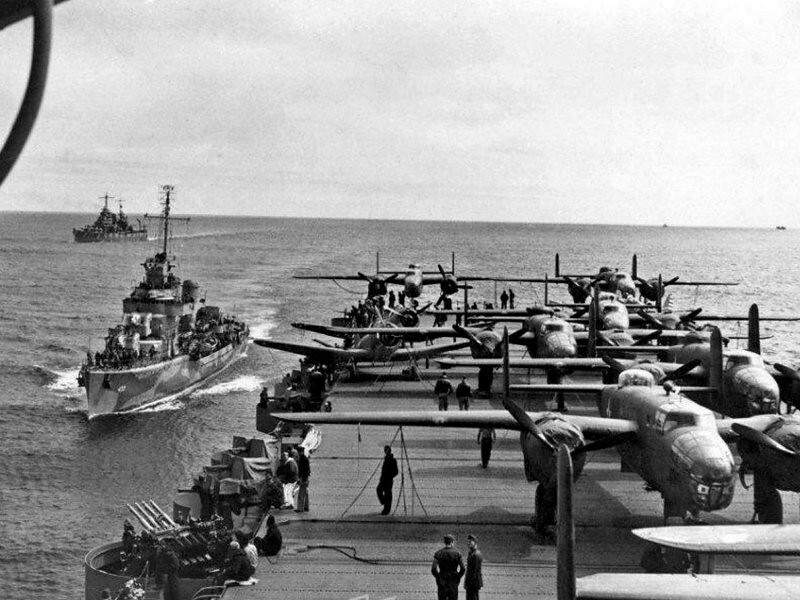 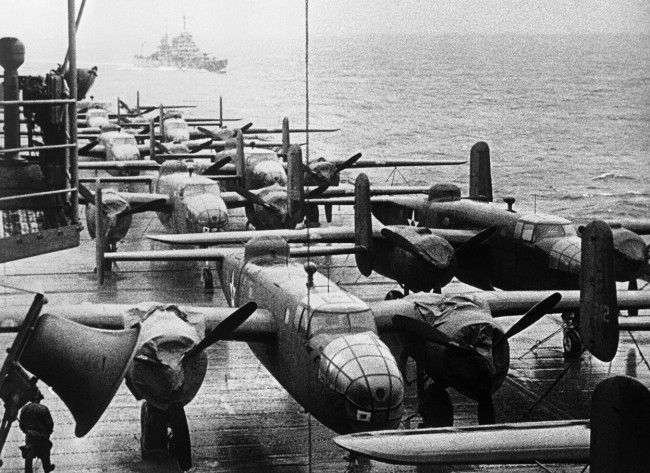 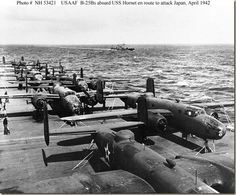 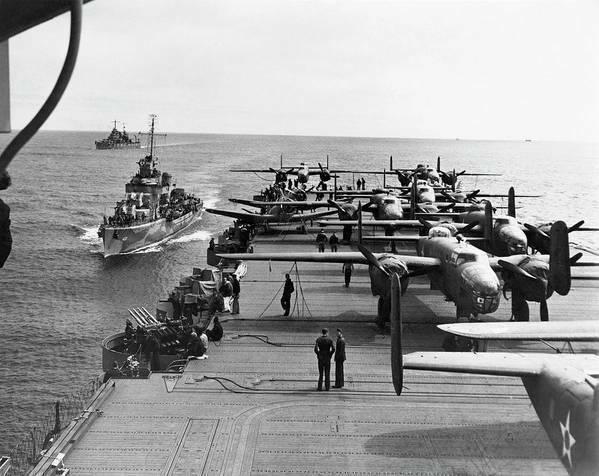 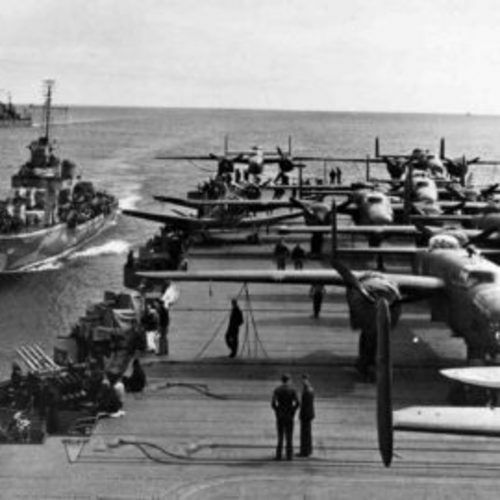 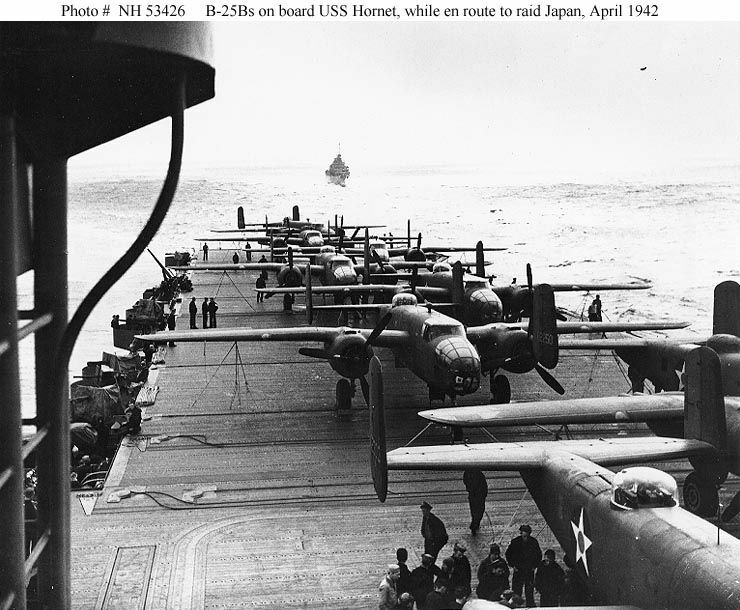 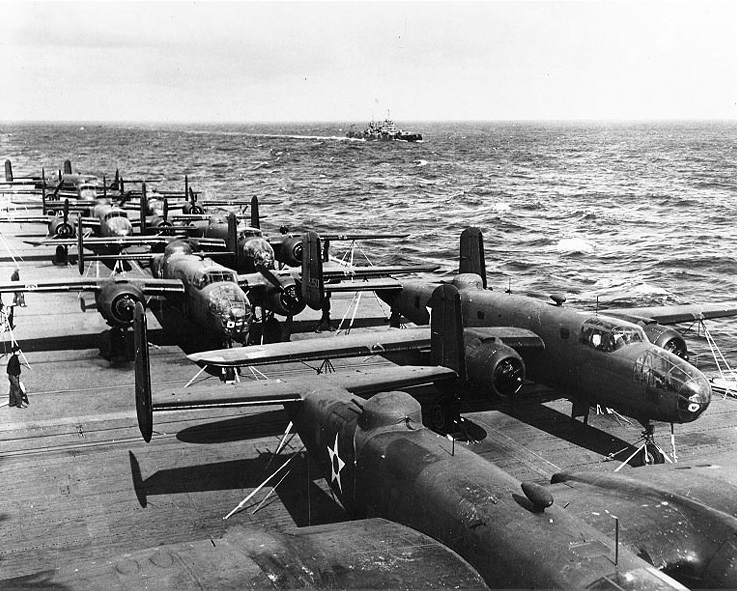 Mitchell bombers and air crewmen on the flight deck of USS Hornet April Doolittle Raid.